Emerging Adults, Life Transitions, Trauma, Relationship Issues, Gender ID, Athletes, Identity Issues. Depression and bipolar disorder; anxiety disorders; disordered eating (eating disorders and variants) and body image concerns; personality disorders (overcontrolled vs. undercontrolled, including borderline personality disorder, self-harm, and suicidality). 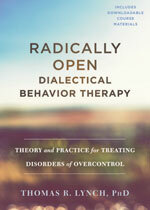 Screening informs treatment options, including radically open DBT, standard DBT, DBT-based mindful eating, and CBT. Individual therapy, skills training classes, and coaching provided for adolescents, families, and adults. Depression, Anxiety, Social Anxiety, OCD, Personality Disorders, Relationship Counseling, etc. Depression, anxiety, Adjustment disorders, trauma, grief, BPD, with individuals and couples.